The Texan's Cowgirl Bride, is the second story in the Texas Rodeo Barons continuity series - a series written by different authors. Although connected with a continuing storyline and that the heroine is the sister of the heroine in the first story, this story does stand on its own. Savannah Baron had inherited the drive to succeed, but her decisions weren't those supported by her father. And since his injury, he was butting into everyone's business. Granted the businesses were family business, but Savannah managed the Peach Pit on the family's ranch. It wasn't a lucrative business like Baron Energies, but slowly she was making it a success. Things were going well, especially after running into widower Travis Shepard, someone who she hadn't seen in awhile, but immediately is attracted to. When she finds a lump and realizes that with her mother's disappearance, she didn't have sufficient family medical history, Savannah turns to Travis for help. As a private investigator, she wants him to find her mother, but keep private the search, as well as her medical scare. Travis was more than willing to help Savannah. He'd been interested in her when they'd been younger, but he'd never thought he'd be willing to risk his heart again. Not that he didn't want to find love again, he just didn't want to possibly go through the pain of loss. Now with Savannah, he was forced to face his fears, and decide if their love was worth the risk. 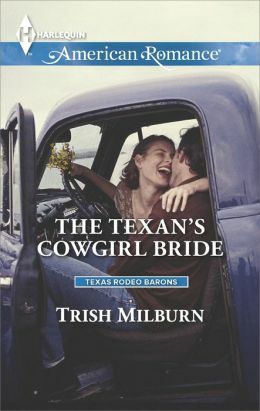 The Texan's Cowgirl Bride is a moving romance between two individuals both having to face and overcome their fears. Savannah has to face the possibility that she has breast cancer, and Travis must face the fact that someone he has come to love could be taken from him. Passionate and tender, this was a touching romance where I was thrilled to watch them finally come together.